A memorial service for the late Inez Blanche Penn (nee Turpin) the widow of the late Mr. Alford Penn (1920-2009) OBE, BEM (first Deputy Governor of the Virgin Islands) was held at the St George’s Anglican Church on 15 November. Mrs. Penn was born on 9 June 1922 and departed this life on 22 October 2014. On her maternal side, her grandfather was of titled high-born Austro-German aristocracy and contributed to her genes additional natural ease with all, urbanity, sophistication of thought and acts, and the attributes of true class. On her highly respected Jamaican paternal side, she was endowed with the priceless characteristics of unmatched Caribbean elegance, poise, wit, and a quality of selflessness and caring that extended itself to both the high and low in equal measure. For many decades Mrs. Penn was a pillar of the Virgin Islands community and extended charitable duties to organizations such as the BVI Red Cross, Mental Health Society and the Beautification Committee. She was a woman of true inner and outer beauty, and her passing saw the penning of many fine tributes in her memory. Most fond in the memory of tribute bearers is the many memorable floral arrangements that thanks to Mrs. Penn helped to beautify some of the most important occasions of the British Virgin Islands. Her husband, Mr. Alford Penn etched his place in BVI history by being the first to be appointed to the post of Deputy Governor, then titled Chief Secretary, a post he held for 14 years. During this period, a true critical time in the political development of the Territory, Alford Penn helped lay the foundation for the public service which we find today. But more importantly, Alford Penn was a figure of regional significance whose contribution to public affairs extended well beyond the shores of the BVI. As it is well-known, successful men are often blessed with a sage spouse. In this case, Mrs. Inez Penn was one of the rare instances where an exceptional mind and exquisite disposition were matched by beauty and innate elegance. Leader of the Opposition, Hon. Ralph T. O’Neal also remembered Mrs. Penn in his tribute. He reflected about the first time he met Mrs. Penn in Trinidad where her husband, the late Mr. Alford Penn was employed by the Federal Government of the West Indies: “After the Federation of the West Indies was closed, Mr. and Mrs. Penn went back home as Jamaica was Mrs. Penn’s home country. Mr. Penn could not resist the urge to come back to his home and undertake the post of Deputy Governor. Of course, Mrs. Penn came and she settled in the BVI. 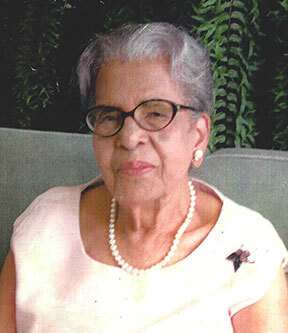 She was a tower of strength at the side of the Deputy Governor, Brother Alford Penn. She was also a business lady, and would never be fearful or afraid to tell British Virgin Islanders about the opportunities for business development in the BVI,” Hon. O’Neal wrote. The late Mrs. Inez Blanche Penn (nee Turpin) is survived by her: Children David Turpin Penn and Alicia Dianne Penn; Nephews—Peter Turpin, Derek Lane, Norman Lane, William Osborne, Reginald Hoyte, Benson Maduro, Glanville Penn, Algernon Penn, Timothy Penn, Ronald Penn; and Randolph Penn; Nieces—Suzanne Turpin Mair, Nelly Alicia Penn Carmona, Linda Lane, Eileen Hoyte Martin, Nadine Maduro Potter, and Verna Penn Moll; plus many other relatives and friends too numerous to mention. The publishers, management and staff of The Island Sun newspaper express deeply felt condolences to the relatives and friends of the late Mrs. Inez Blanche Penn (nee Turpin).